I made 3 of these 14″ squares for a kitchen tablecloth. I thought the pattern might look better in white. I have never started the white one. The pattern calls for 9 of these squares to make a square tablecloth. Since I am heading into sewing and away from thread crochet, I wonder if I will ever do this type of work again. The gold squares can still be used for doilies, or maybe a pillow. Who knows, maybe I’ll be sewing them to something with the new machine. 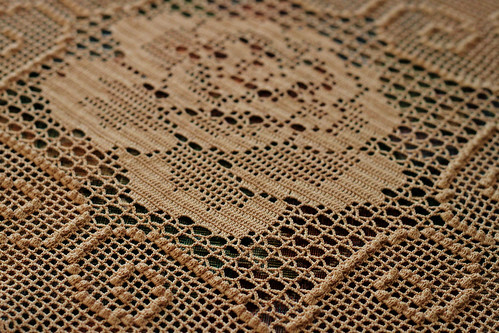 This entry was posted on Thursday, October 22nd, 2009 at 3:00 am and is filed under Crochet and Doily. Tagged: Crochet, Doily, Lace, Thread. You can feed this entry. You can leave a response, or trackback from your own site. The squares are very pretty. Maybe you could incorporate them into embroidered cushion covers, for a very girly bedroom? Very pretty! I’m sure you’ll find a use for them. WOW!!! You crocheted that? That’s gorgeous! You are a very skilled needleworker! WOW! DID I say WOW again? WOW! There are such lovely vintage projects. I love the work, but I’m trying to simplify my work load to have more time for knitting and gardening–lacework that looks best starched and ironed or stretched, was the first to go, along with many dust-collecting knicknacks. So I’m glad to be able to enjoy your photos of these beautiful things.